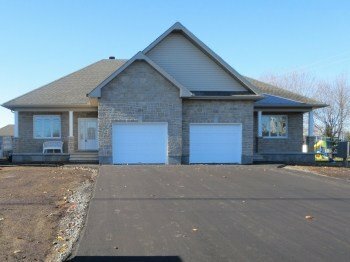 Brand New Custom Luxury Bungalow Just Outside of Ottawa – 1134 St. Augustin – $309,900 – SOLD! New Construction! Now Ready for Occupancy! Beautifully Designed Custom Bungalows quality built by D. Brisson Construction with full Tarion Warranty. View the Photo Gallery or View the Video on Youtube! Enjoy 1394 square feet of luxurious living space all on one floor. The elegance starts with the stone fronts set well back from the road with single garage and generous 17′ front porch. Step in to a very large welcoming foyer with inside access to the garage and main floor laundry. The front bedroom could also double as a den or office with close access to the main bathroom. Open concept living area boasts beautiful wood cupboards in the kitchen, with cove mouldings and valance eat-at counter and soft-close drawers. Large bright dining room and living room with sliding doors to the 12′ by 10′ deck overlooking the back yard. Master Suite – The spacious private master suite is situated at the back of the home and offers a walk-in closet and an oversized five piece en-suite with his and her sinks, a walk-in shower and soaker tub. Great layout for those desiring a lifestyle on one level with very little maintenance and great space and quality – check out the floorplans attached below. Heavily Upgraded – Lots of upgrades that would normally be extra in a new build have already been included here – stone fronts, 17′ front porch, porcelain floors, upgraded windows, stylish high pitch hip roof with upgraded shingles roof, central air, central-vac rough-in, garage fully insulated and drywalled, 12′ by 10′ rear decks, eaves troughing installed, basement walls drywalled to the floor ready to paint with electrical outlets built-in, rough-in for third bathroom downstairs, paved driveway, landscaping with sod in the front and seed in the back, rough-in for dishwasher and icemaker, high efficiency Gas furnace, air-exchanger, even pot lights in the eaves to welcome you home at night. Just bring your furniture and enjoy your new home right from the start. Location Location! – Unique opportunity to have brand new construction but right in town on larger in-town lots. Just a few blocks walk to Groceries, Church, Restaurants, Parks etc. Call Eric Manherz at 613-601-6404 today for an appointment to view this bungalows.